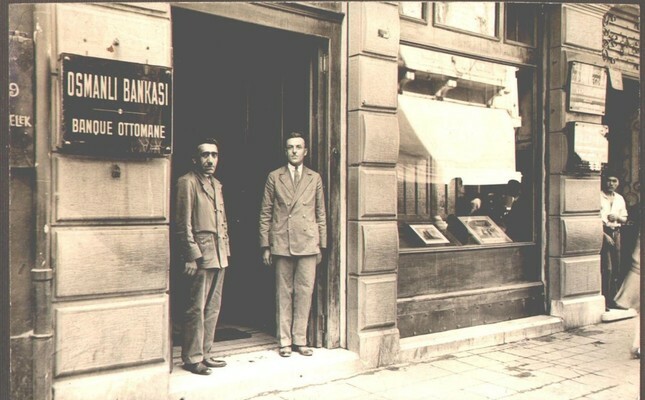 Two men stand at the entrance of the Ottoman Bank’s Beyoğlu branch circa 1930. Banking practices first emerged in Italy in the 13th century and spread around the world in time. Banks started to serve as prominent facilities in Europe where business activities developed considerably in the aftermath of the Industrial Revolution. At the time, the Ottoman Empire had strong business relations with Europe, and the first example of banking facilities in the Ottoman Empire started to emerge in those days. The Ottoman government borrowed from two moneychangers who officiated worked as modern bankers based in the Galata neighborhood in 1845. As the agreement required, the moneychangers pegged the rates to British pounds sterling, and in return, they were allowed to found private banks. Hence, the first Ottoman bank was founded in 1847 under the name Bank-ı Der Saadet. But, the bank did not have any capital. As its bills were accepted and circulated just because of the prestige of the founders, the establishment went bankrupt after a short while. With British capital, Bank-ı Osmani (Ottoman Bank), whose headquarters were in London, was founded with in 1856. With the participation of French capital in 1863, the bank continued with the name Bank-ı Osmani-i Şahane both as a central bank and a facility for business and investment. In 1877, the government borrowed from the moneychangers in Galata and the Ottoman Bank for the 1877-78 Russo-Turkish War. The Ottoman Bank is considered the first modern bank in the Ottoman Empire and the modern Republic. The bank even had the privilege of minting money. It went on serving for a long time after the foundation of the modern Republic of Turkey under the name Ottoman Bank. Founded with capital sent to Ankara by Muslim Indians who wanted to support the Turkish government in their war with the Greeks in 1920, İş Bank became the rival of the Ottoman Bank as the representative of Istanbul capital and won the fight, becoming the moderator of the new financial system of the country. In other words, it was Ankara that won out over Istanbul. After the Ottoman Bank, several banks - all owned by foreigners - opened over time. As both İş Bank and the Ottoman Bank were founded with foreign capital, they provided loans mostly to foreign tradesmen. Hence, locals went to moneychangers, nearly most of whom were non-Muslims or to the state office, which kept the assets of widows and orphans. With the efforts of Mithat Pasha, the governor of Nis province (in modern-day Serbia), the first Security Fund was founded in Ruse - the fifth biggest city in modern-day Bulgaria - with Ottoman capital in 1863, and a second one opened in Constantinople five years later in 1868. The funds were run by the public under the control of the government. Possessions of the public were collected in the Security Fund, and those who applied for loans were given the money in pawns or with guarantors. However, Security Funds were given to the authority of Ziraat Bank in 1907 due to financial and political crises. At the time, interest transactions were not legal as sharia law - the law enforced in the empire - required. However, Islamic law allowed interest transactions conducted in foreign countries. As the center of the bank was based abroad, its transactions were not taken as illicit in terms of Islamic law. While providing loans, one would buy something for a high price from the creditor. Ottoman banks' working principle was as such. For example, when a customer wanted a loan of 100 coins, the teller sold a pen, book or watch to the customer in return for nine coins on account and then provided the loan. Hence, the customer became indebted to the bank for 109 coins. This kind of sale (muamala), which functioned as a solution at times when it was impossible to find interest-free loans in case of money shortages, was called a transaction sale. The minimum price for the extra payment was decided by the government on the basis of market conditions of the time. The limit of the amount was 10 percent in the time of Sultan Süleyman the Magnificent (1526-1566), 15 percent in the time of Sultan Abdülmecid (1839-1861) and 9 percent in the time of Sultan Abdülhamid II (1876-1909). Transaction sale can be considered a kind of trick, but it was not so. On the contrary, it was a solution presented by law. Borrowing and sale were accepted as two different transactions. What is more, customers were free to decide on the sale figure. There were money foundations that served to meet banking needs in the Ottoman Empire before modern banks emerged. Some of the wealthy devoted money to foundations to provide loans to the needy. However, they fizzled out, as they were so few in number. To be able to support the community to pay unexpected taxes easily, wealthy people established special foundations to help one another. Those foundations were also taken as money foundations in a way. They were not just for helping with tax payments, they also helped those who could not work due to sickness, hold funerals for the needy, help needy young ladies in marriage preparations, establish businesses for needy young men, help families who lost their homes due to fire or collapse and the repair of roads, bridges, walkways and water lines of villages and neighborhoods. A considerable number of these foundations were handed over to municipalities in 1869. After the proclamation of the Republic, all of them were nationalized. With the initiative of Mithat Pasha, the governor of Danube province (Nis, Vidin and Silistra), "memleket sandıkları" (country funds) began to be established in every town starting in 1863. Those funds were founded to serve in the stead of the special foundations mentioned above. A specific amount of the number who was gained through selling what they grow in the villages was put in the fund. When the money reached a specific amount, it began to be given as loans to villagers. Term loans, the maturity of which changed between three months to one year, were given in return of 12 percent and a guarantor. At the end of the year, one-third of the pure profit was distributed to the villagers on the basis of their capital. The administration of country funds was the responsibility of four people elected by the community. Consisting of a district governor, a judge and two people elected by the community, the administration board for the fund governed the functioning of the fund. The funds, which were founded with the aim of protecting villagers from pawnbrokers and boosting production, were the first example of cooperatives in the country. After being named "Menafi Sandıkları (Benefits Funds) in 1883, they were transformed into Ziraat Bank in 1888. Agricultural Credit Cooperatives, which were established in 1935, correspond to country funds.